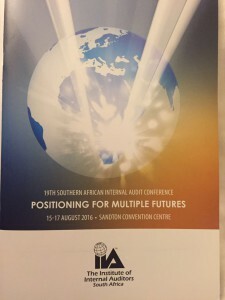 BarnOwl was the proud sponsor of the guest speaker, none other than Clem Sunter at The Institute of Internal Auditors South Africa (IIA SA) CAE luncheon, exclusively for Heads of Internal Audit (CAEs), Directors, Audit Committee Members and CEO’s held at the Sandton Convention Center, Johannesburg on the 17 August 2016. Highly acclaimed locally and internationally, Clem Sunter is South Africa’s pre-eminent scenario planner and voted by leading South African CEO’s as the speaker who has made the biggest impact on local best practice. Clem demonstrated in his presentation how critical risk management has become and how important it was for organisations to take it seriously and to stop just ‘ticking the governance box’. Strategic decisions that are made today play out in 5 years’ time; if today’s risks / flags and their trends are not monitored and taken into account when making business decisions today this may well lead to business destruction. Good governance is essential especially considering current trends of globalisation and regulatory complexity, the slow economic growth and the growing anti-establishment flag (risk). Clem spoke about ‘flags’ (essentially risks and events); ‘cloudy’ flags that come and go and are unpredictable and ‘clock-work’ flags that are 100% predictable like the ageing European, Chinese and Japanese population which will have a huge impact on global economic growth and commodity demand in the immediate / near future. In contrast, South Africa has the opposite where 50% of the population is under 23: (i.e. ‘born frees’ in and after 1994). On the international front Clem spoke about 5 flags which are becoming worrisome and could spill over into South Africa and / or certainly affect our economy being part of the global village: 1) The Religious flag (ISIS, Syria etc.) ,2) The Russian / Putin flag (Crimea, USA sanctions, NATO versus Russia, Baltic states conflict), 3) The Grey flag (ageing populations in Europe, Japan, China not contributing to economic growth but rather draining local economies by requiring state care), 4) the Anti-establishment flag (fury of the middle class (no longer just the fury of the lower class) with the super-rich driving the need for good corporate governance and a squeaky clean corporate image as anti-establishment fury builds), 5) the Green flag (climate change, rising sea levels, record temperatures in Australia, water shortages, increased frequency of extreme weather events. This does however create opportunities for ‘smart’ energy). On the local front Clem spoke about 6 flags that could be game changers such as: 1) Corruption, 2) Quality of infrastructure (physical, education, heath, electricity, water etc. ), 3) Inclusive leadership and the quality thereof, 4) Pockets of excellence, 5) Level of economic freedom (Government needs to grow, support, encourage and make things easier for entrepreneurs and SMMEs) and 6) World at work (mechanisation and technology disrupters). In summary, Clem mentioned that Risk Management is a key discipline for any company and critical when determining / setting company strategy. Risk management needs to be dynamic with a real-time view of your risk profile and watching the flags (Key Risk Indicators). Clem mentioned that internal audit together with their risk and audit committees play an invaluable role in raising the awareness (to the board and exco) of the critical need to monitor and manage risks both externally and internally. BarnOwl is privileged to be a member of The Institute of Internal Auditors South Africa (IIA SA) and to have contributed to CAE luncheon. We thank Clem Sunter for coming to talk to us and share so many of his valuable insights. BarnOwl is a fully integrated governance, risk management, compliance and audit software solution used by over 200 organisations in Africa, Europe and the UK. BarnOwl provides a system-wide view of your risk universe at a strategic group level as well as at each individual business unit level and / or process level. 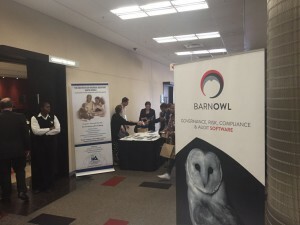 BarnOwl provides an early-warning system and keeps risk managers / management appraised of a changing risk environment improving their insight and oversight of issues and exposures at every level of the organisation enabling an organisation to respond appropriately / proactively to risks that might adversely affect the realisation of the organisation’s objectives. Barnowl supports true risk and control based auditing ensuring that risks that matter to your organisation are audited and that the results are updated back into risk management.